Friday July 24 - 1931 A letter from Laura. Wrote to them. Soon after dinner went up to Dr Urbans for treatment. Paid my bill there. slept part of afternoon letter from Ida. Was on the porch in evening. Ott very much better. They sent word to LeGrand he leaves for home tonight Saturday July 25- 1931 I was busy about the house most of the forenoon Ott still better. I wrote Ida & Winnie rested in PM Went home with Rob for supper. We had a ride after supper. I came home by taxi at ten oclock Sunday July 26- 1931 I went to SS & Church with The Andersons. slept part of afternoon. Hattie has a cold so was home all day. A delightful ride with The Gays after supper. a hot day. Monday July 27- 1931 Frightly hot. Le Grand reached home this AM Ott some better. Rob took me up there at three oclock. Later Le Grand came there. He and Hattie took flowers to the cemetery. Hattie & Cora brought me home at 9. 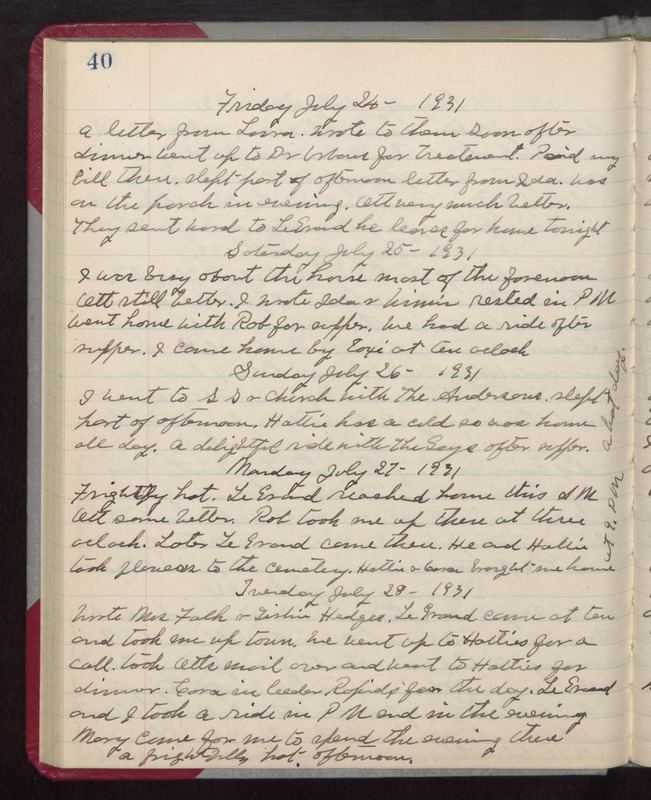 PM Tuesday July 28- 1931 Wrote Mrs Falk & Tishie Hedges. Le Grand came at ten and took me up town. We went up to Hatties for a call. took Otts mail over and went to Hatties for dinner. Cora in Cedar Rapids for the day. Le Grand and I took a ride in PM and in the evening Mary came for me to spend the evening there a frightfully hot afternoon.